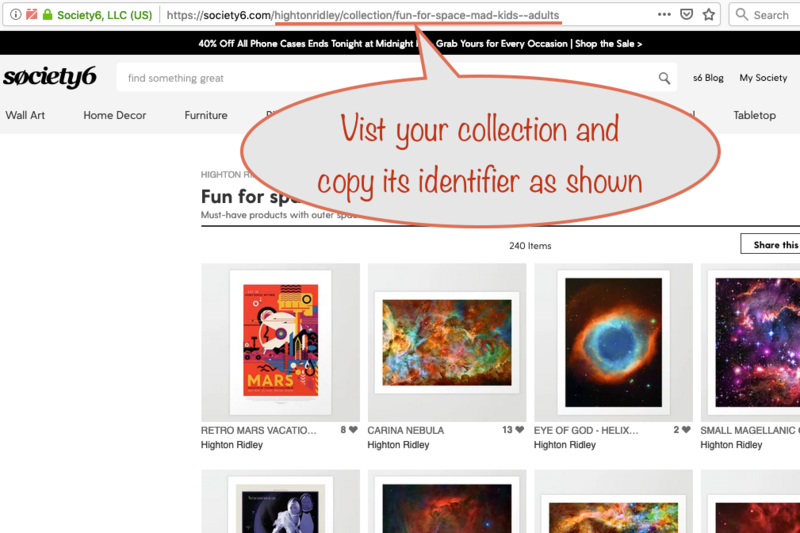 First off, open the Society6 Nifty CPanel (opens in new window) and put in your curator id, if you have one. If not, leave the default. 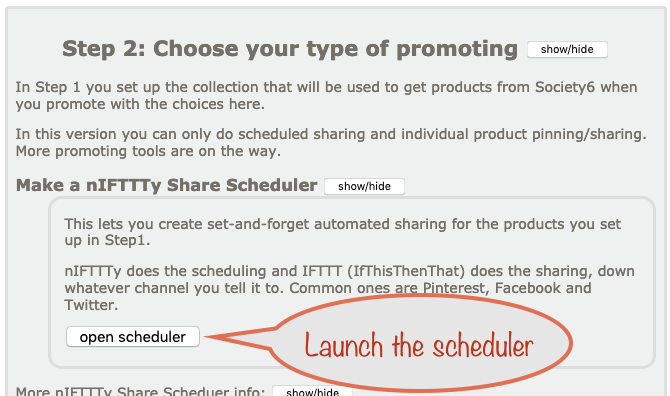 Now choose the days of the week you want for your pins and the times for them to pin. 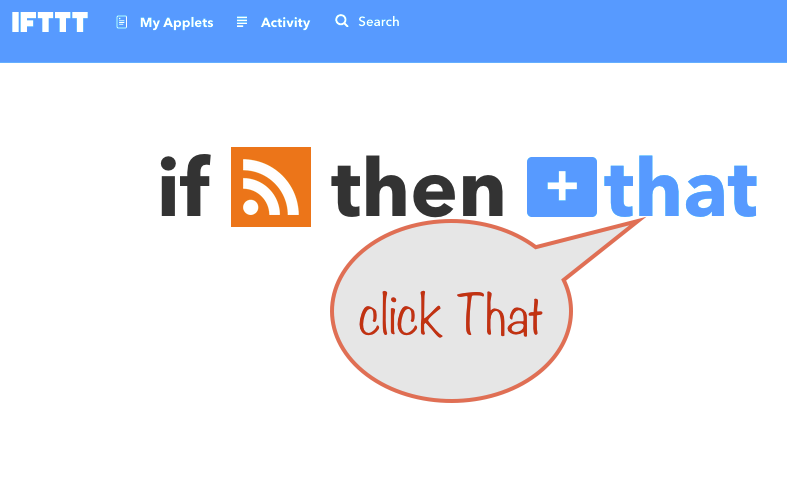 IFTTT phrases its applets like this “if this (some input condition) then that (some action down a channel). 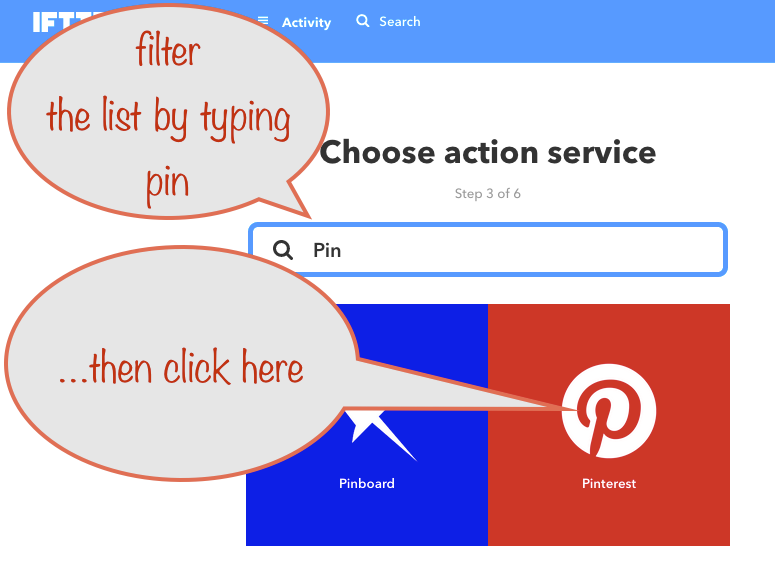 Give a board name to pin to. It’s case sensitive so make sure of your typing! 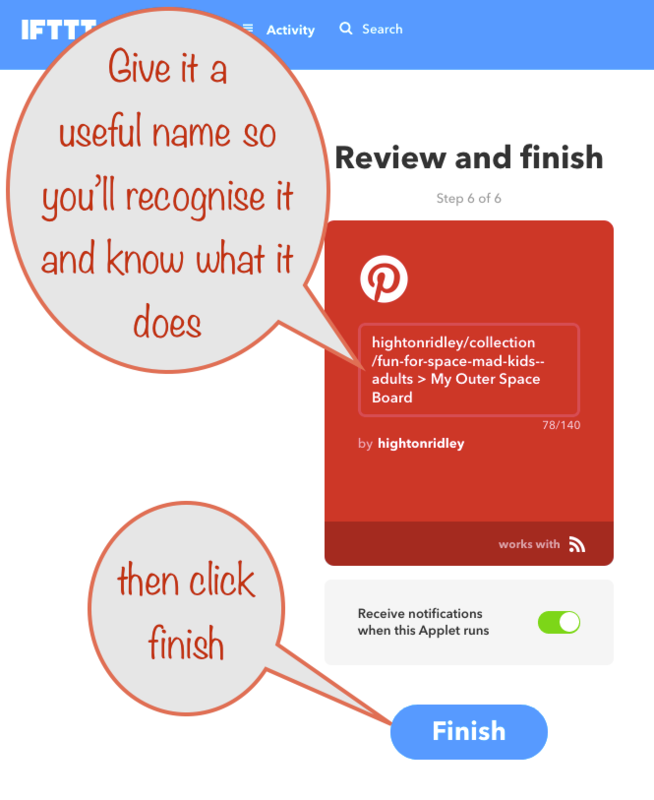 If you give a name of a board that doesn’t exist, a new one will be created automatically behind the scenes on the very first pin. Give it a meaningful name so when you come back to it later, you’ll know what it does. 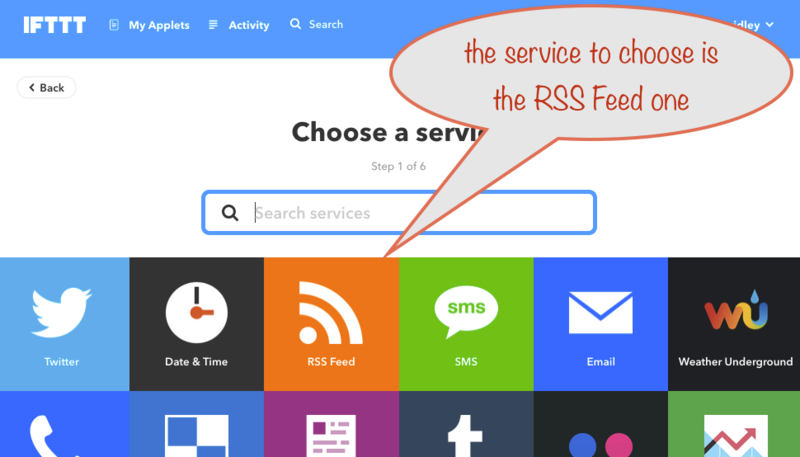 The feed url produced by the nIFTTTy Scheduler does something very special – it always produces an empty feed unless a timeslot is active. Active means that it’s one of your chosen days, the timeslot start has been reached and 30 minutes haven’t yet passed since then. If one is active, then the item that appears in the feed is the ‘next due’ one. How does it know which one is due? 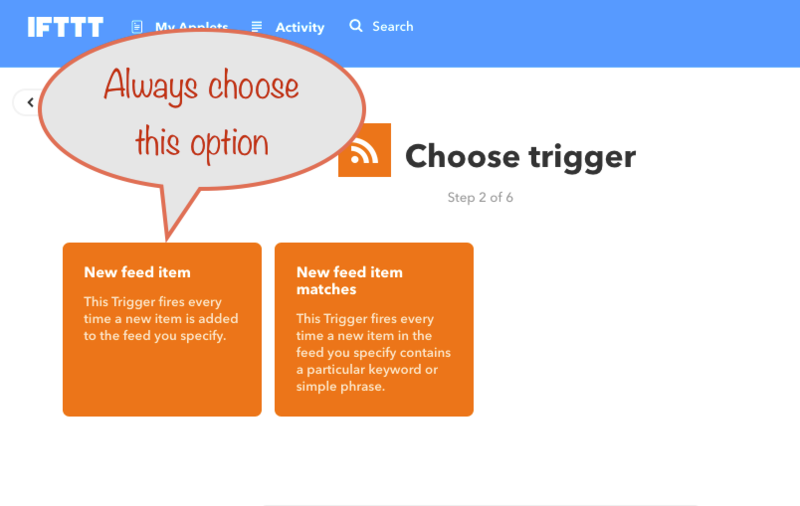 So when a timeslot is active, the next due item from your collection is picked and will appear in the feed if it’s requested. 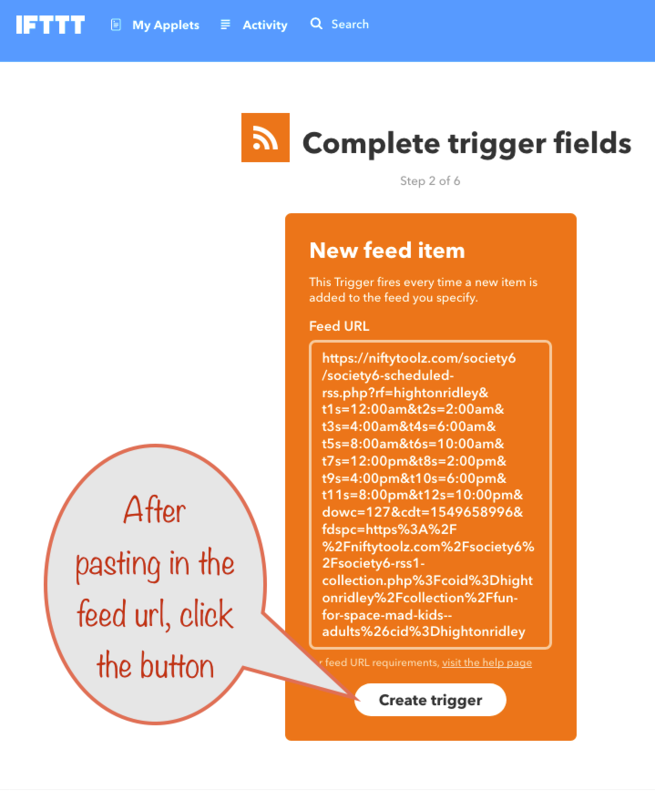 During an active timeslot, when IFTTT checks (requests) the applet’s feed url, it doesn’t get an empty feed, it gets a feed with that one item in it. 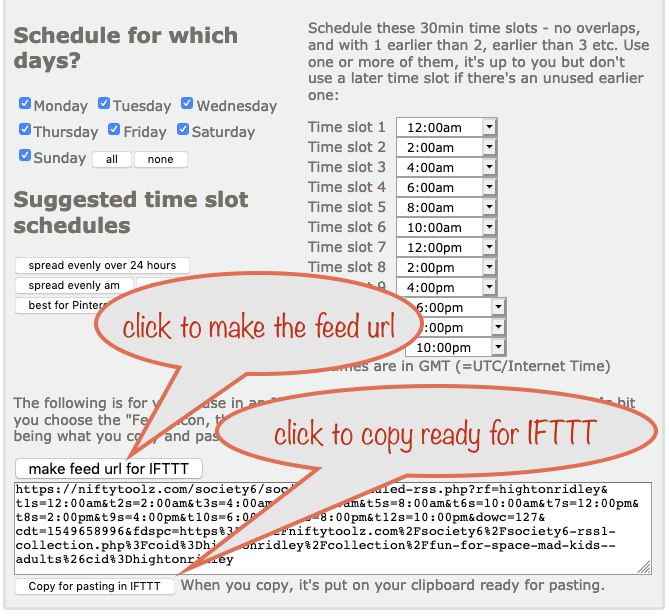 NB IFTTT checks an applet’s feed every 10 or 15 minutes or so, and that accounts for a timeslot being 30 minutes long – to give IFTTT time to check it! 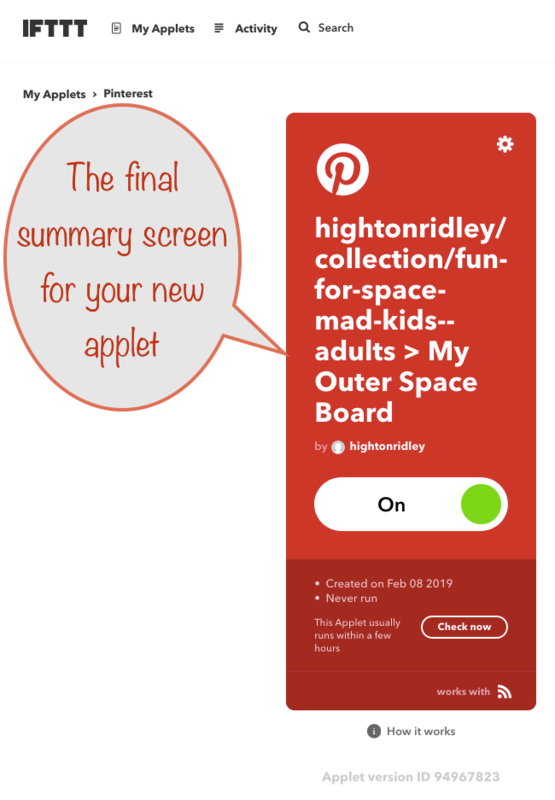 As long as the applet’s not seen that item before, IFTTT will pin it where you told it to. ℹ️ Be aware that if you make your schedule after some timeslots have already passed for the day, your first pin won’t come from the start of your collection. then here’s a surprise – the first possible item to be pinned from the collection will actually be the fourth because the first three timeslots have already passed. If I’d made the schedule at 5:00am (and finished making the applet soon after) then the first item to be pinned would be the first in the collection. The internet’s not perfect and sometimes glitches occur while one service is trying to communicate with another. It’s a fact of life. 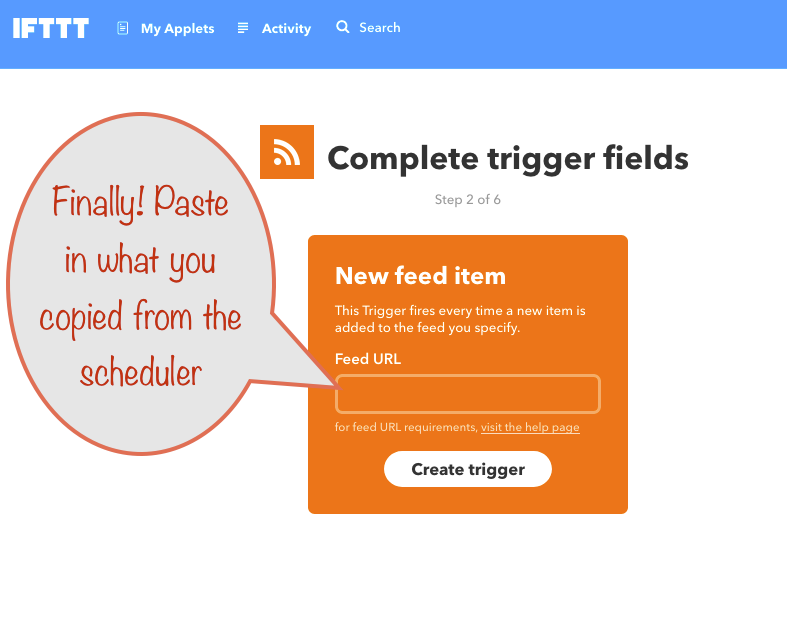 IFTTT doesn’t know about active timeslots, all it does is keep checking the applet’s feed url every so often. If it fails when a timeslot isn’t supposed to be active. No worries just ignore the fact. No harm done. 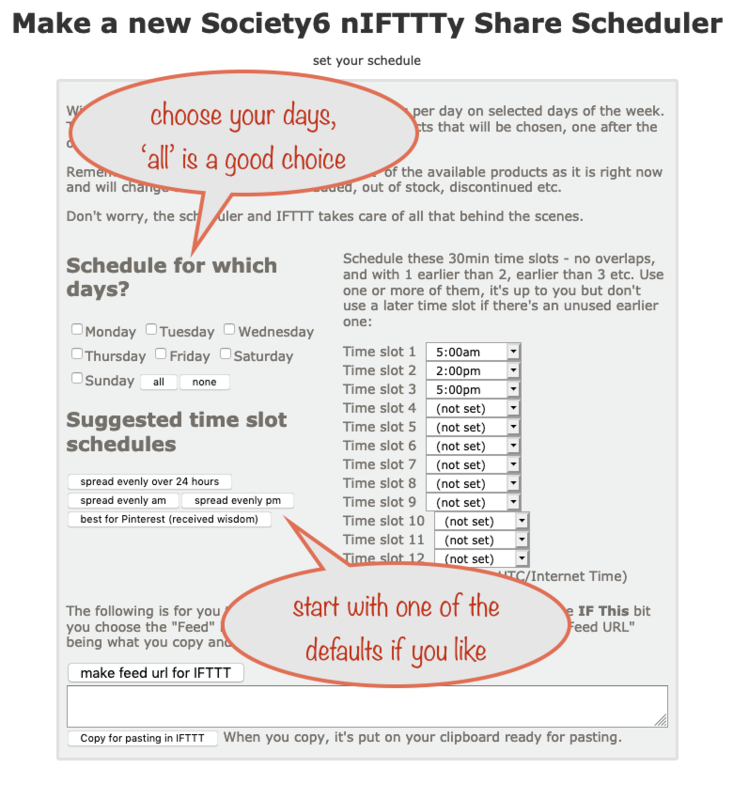 It could fail when a timeslot is active but again, not to worry because it will retry a few minutes later. The chances of two such failures in a row when a timeslot is active is very, very low. So low, you can ignore it. 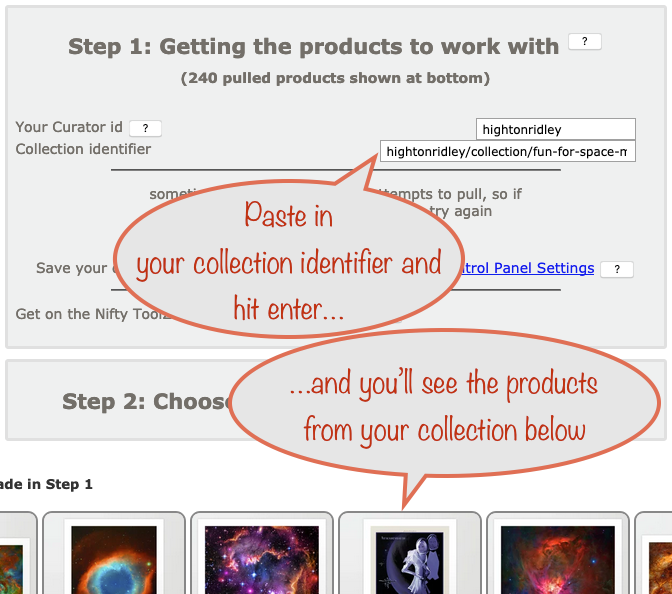 Eventually, when your collection has had all its items pinned, the feed url will never again produce an item. 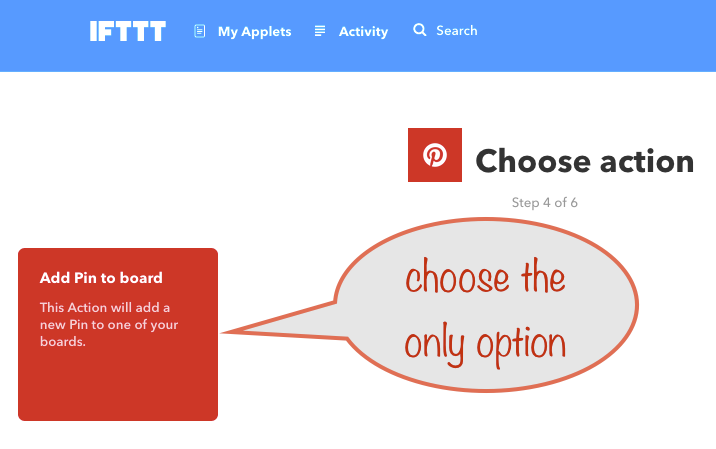 At that point you’ll see nothing but failures and it’s time to delete (or switch off) that applet.